A shortage of new homes is helping to boost property prices in the U.K.
Is the U.K. at risk of another real estate bubble going pop? 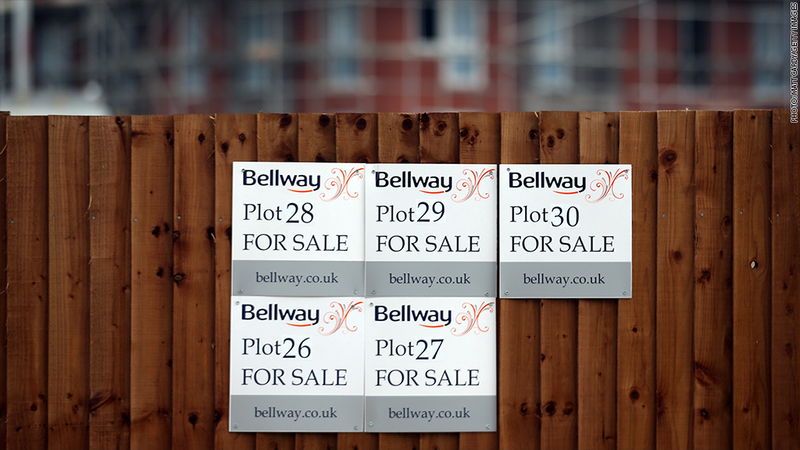 A quick look at house prices may ring alarm bells. The U.K. is the fastest-growing developed nation, and the average cost of a home is 20% above the pre-crisis peak in 2007. 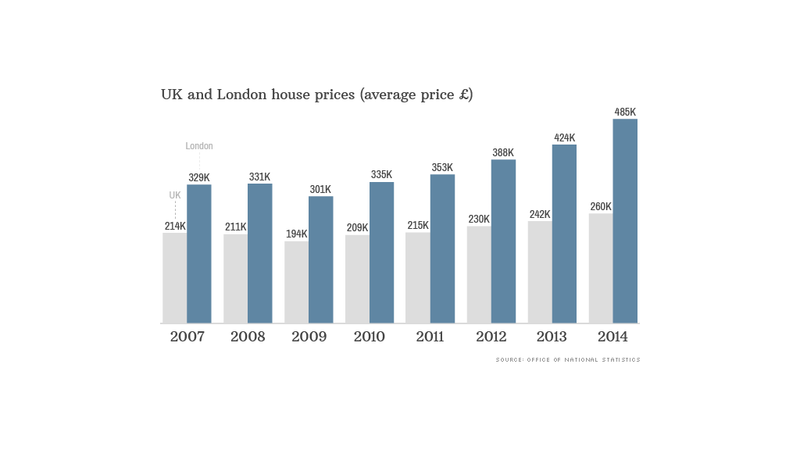 Home prices are gaining at an annual rate of 10%, and almost double that in London, where the average price has hit nearly £500,000 ($850,000) -- 46% above the pre-crisis peak. Boosting demand for homes: Record low interest rates, robust economic activity, a rapid fall in unemployment, and population growth. 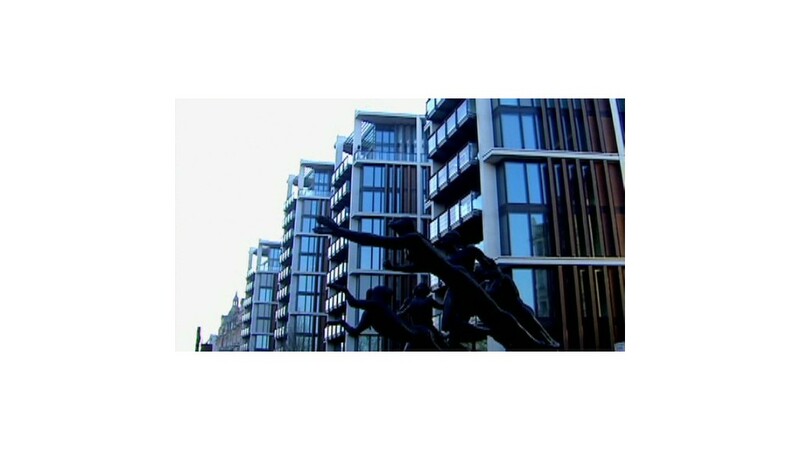 Add to the mix mortgage subsidies and guarantees under the government's Help-to-Buy program. 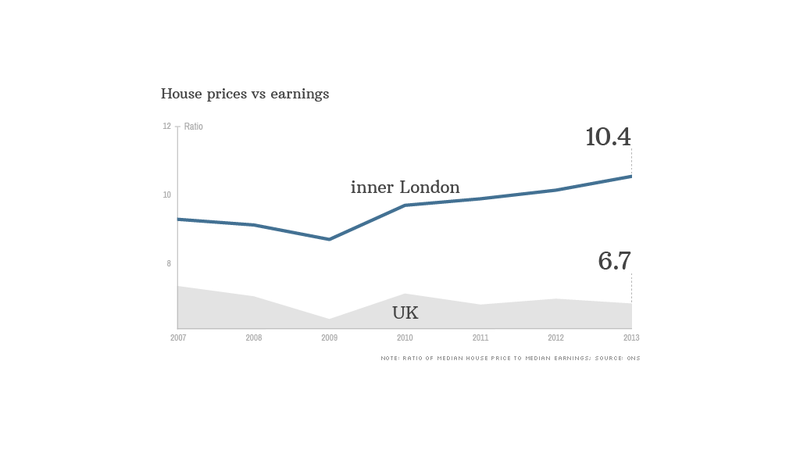 An influx of foreign buyers, often paying cash, has increased pressure on the market in London, where average prices are now nearly 10.5 times average earnings, compared with nine times in 2007. That's forcing borrowers to stretch their finances further than ever. Bank of England Governor Mark Carney says he's watching the growth in large value mortgages very closely. And with good reason -- 13% of single borrowers are taking out mortgages of at least four times their salaries, up from a low of 8% in 2009. 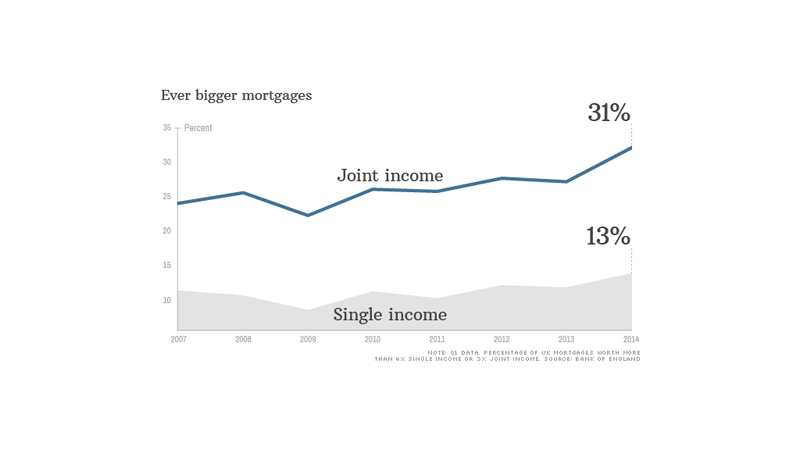 The trend among joint buyers is even more marked -- 31% are borrowing more than three times joint income, up from 23% in 2007. While most experts would agree London is looking frothy, opinion is divided over whether the wider UK market is heading for a bubble. The average home is no more expensive, as a multiple of earnings, than it was before the financial crisis. 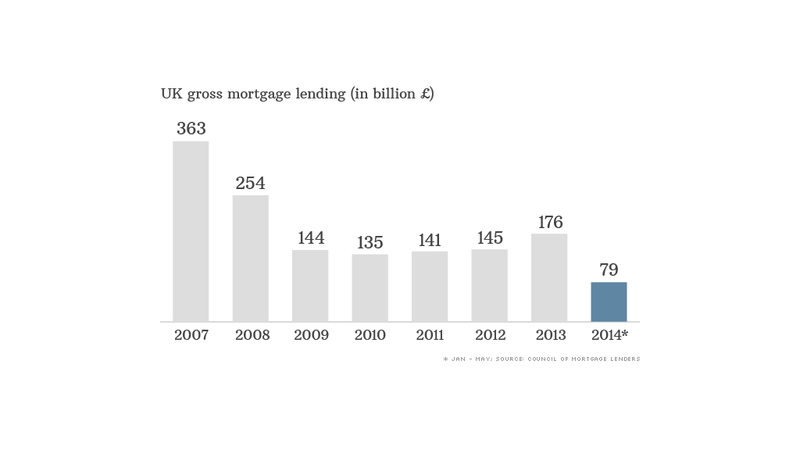 Mortgage lending has recovered from its 2010 trough but, at £176 billion, is still way below the levels seen in 2007. "We note only moderate growth in net mortgage lending across the U.K. since 2013, and we perceive that most of the appreciation in U.K. house prices is being fueled by cash-only transactions in the London market," said ratings agency Standard & Poor's earlier this month. There are also signs tougher regulations on mortgage lending, introduced in April, may be beginning to act as a brake on activity. But there's no room for complacency given robust demand and a chronic shortage of new homes -- a problem the Bank of England can't solve. And with the first rise in interest rates still months away, Carney is expected to announce further curbs on mortgage lending on Thursday. He may even recommend the government scale back Help-to-Buy. -- Irene Chapple contributed to this article.